Nafeez Ahmed's The War on Freedom, How and Why America was Attacked, September 11, 2001, published in 2002, was the most important and influential 9/11 truth book until David Ray Griffin's The New Pearl Harbor came out in 2004. (Griffin has acknowledged borrowing heavily from Ahmed.) Gore Vidal called The War on Freedom "Far and away the best and most balanced analysis of September 11." Dr. Ahmed has published several other important works on the "war on terror" and related subjects. He is a contributor to 9/11 and American Empire v.2: Christians, Jews and Muslims Speak Out, which was recently translated into Arabic. 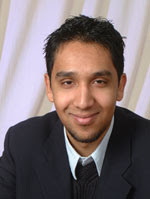 Biography from Nafeez Ahmed's website: Dr Nafeez Ahmed MA DPhil (Sussex) is a bestselling author and political scientist. He is Executive Director of the Institute for Policy Research & Development, and has taught international relations theory, contemporary history, empire, and globalization at the School of Global Studies, University of Sussex and Brunel University's Politics & History Unit. He is Strategy Director for Creative Education at Arts Versa Consultants, where he has consulted for projects funded by the Department of Communities & Local Government and the US Embassy in London. His books include A Users Guide to the Crisis of Civilisation: And How to Save It (forthcoming in August 2010), The London Bombings (2006); The War on Truth (2005); Behind the War on Terror (2003); and The War on Freedom (2002). He has been an expert commentator for BBC News 24, BBC Radio Five Live, BBC World Today, BBC Asian Network, Channel 4, Sky News, C-SPAN, CNN, FOX News, Bloomberg, PBS Foreign Exchange, Al-Jazeera English, among others. Dr Ahmed’s terrorism research was used by the 9/11 Commission, and he testified in US Congress in summer 2005. He has also advised the Royal Military Academy Sandhurst; and the UK Parliamentary Select Committee for Communities on its Inquiry into 'Prevent'. Congratulations on courageously and freely stating your opinion. The facts are in. Nano-thermite, freefall, molten metal. If the panderers of the official conspiracy theory want to continue to discuss 9/11 with any intelligence at all, they should debate the facts or, if they are really serious, publish a scientific rebuttal. No counter-argument can be meaningful until they explain the presence of nano-thermite in the dust of 9/11. Ahmadinejad: 9/11 Attacks a "Big Lie"